with global oversight and seamless processes. Seamlessly manage your quality processes and content with the Vault Quality suite of applications. All parties – life sciences companies, contract manufacturers, and suppliers – have access to a single authoritative source, enabling greater visibility and control. Vault Quality enables organizations to modernize quality management, assuring quality while driving compliance and operational innovation. Complete Quality Solution: Manage quality processes with regulated content and data across the organization and with partners for greater control and visibility. Controlled Collaboration: Easily supports multiple outsourcing models, aligning global quality processes for greater automation and operational effectiveness. Modernizing Quality Management: Quickly get up and running in weeks with an easy-to-use application that has built-in best practices, and securely incorporates all parties into key processes. With a cloud-based solution, organizations can quickly leverage new capabilities continuing to meet business and regulatory requirements. Vault QMS provides global management of quality processes – for all parties – enabling end-to-end control and visibility. 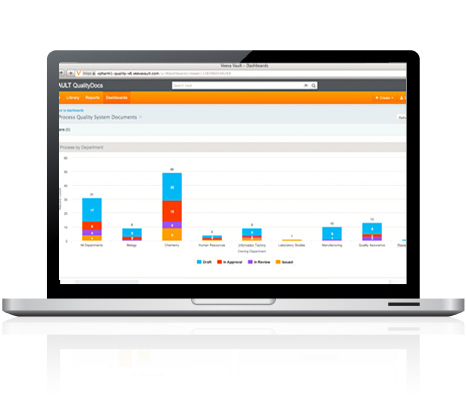 Easily support proactive management initiatives and Deviation, Internal/External Audit, Complaint, Lab Investigation, Change Control, and CAPA processes, or configure your own. Vault QualityDocs provides a single global source for all quality, manufacturing, validation, and other GxP documents. Vault’s state-of-the-art technology and UI improves adherence to—and reduces the burden of—GxP compliance. Veeva Vault Station Manager is a mobile application for delivering the right content to the shop floor. With easy access to information and greater agility to meet manufacturing demands, companies can enhance compliance and drive greater efficiency. Veeva Vault Training manages training and related compliance requirements to ensure role-based qualification for job and audit readiness. With Vault Training, easily streamline training processes, demonstrate compliance, and always stay inspection ready. Planned for availability in late 2019.